Now that we have lost XIV and SVXY is half of itself, we can see that in some ways, VVIX might have changed. 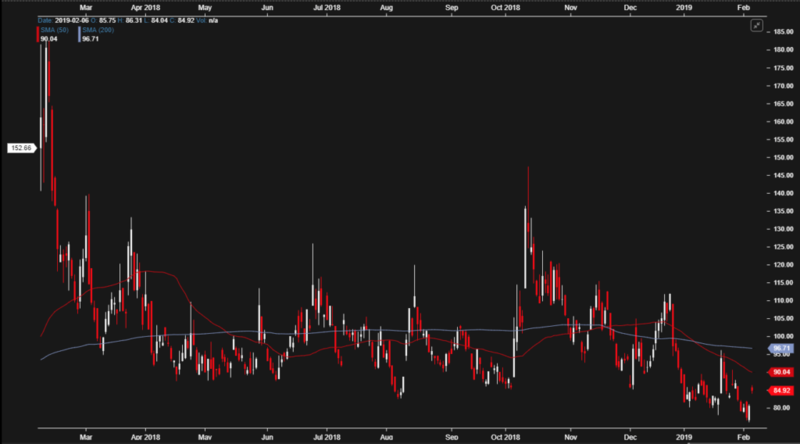 The VIX got to 37 in December and VVIX barely ralliued. Its was near 16.5 on Monday and VVIX was 77. In 2018 a 16.5 VIX would have brought us a VVIX of 100. Today, with the ETP’s out, the VIX demand for options is way down and the need to ‘chase’ is probably reduced. Yet, here we are today, VIX is lower than it was Monday, but VVIX is near 85 now. This means that despite the world seeming much safer than it was a week ago, at some point traders are willing to step in and buy options if VIX IV gets low enough. That level appears to be below 80 right now. That said, I would point out that in 2012 and 2013 before the ETPs took off I recall 77 being at the top end and a VVIX in the high 60s and low 70s being far more normal than 80…The point is levels change. So what does this all mean? For now when the VVIX gets below 80, it is probably a chance to buy somewhat aggressively. We noted on Bloomberg yesterday I commented that I thought VIX backspreads were too cheap. I was right, back spreads were too cheap. Basically, if one can buy a call 1 by 2 (selling 1 buying 2) 5 bucks wide with more than 60 days or more, that is a hedge I would aggressively put on against a long position if I ran a static or semi-static hedge program (I don’t).